Why would anyone kidnap six complete strangers - a doctor, an engineer, a student, a cop, a convict, and an autistic savant - and trap them inside a giant 3-D high-tech maze constructed of cojoined cubes? Why would they rig some of those cubes with sadistic booby traps that alternately slice, burn or otherwise mutilate anyone unlucky enough to enter? 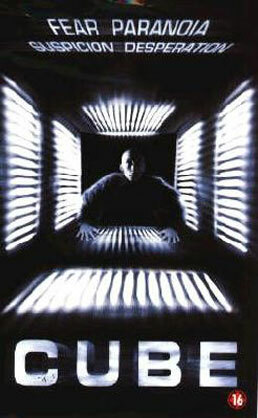 That question is never answered in Cube, the 1998 indy film directed by Canadian Vincenzo Natali. Why really isn't the point of Cube, but rather how a disparate - and desparate - group of regular folks would behave if placed in this outrageously cruel situation. With no food or water, and no clue as to why they're there or who's behind it, the befuddled and angry test subjects must learn to work together in order to hopefully escape the Cube.